Rugby statistics: Who is the most prolific try-scorer in Europe? 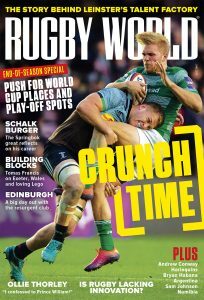 When it was announced in January 2014 that Thomas Waldrom would be joining Exeter Chiefs, head coach Rob Baxter said: “We feel his best years are probably still to come.” The Chiefs boss made reference to detailed analysis carried out on his new recruit, but it is unlikely those rugby statistics would have pointed to ‘the tank engine’ topping the try-scorer table. Previous trends would suggest a likely Premiership top try-scorer to be a winger, play an average of 20 games and for a team finishing in the top four places. Exeter scored 40 tries last season and finished eighth, with 11 defeats in 15 matches from the end of November onwards, while No 8 Waldrom had scored 13 league tries in four years at Leicester Tigers. There wasn’t much evidence then to suggest he would score 15 tries in this campaign and be closing in on Dominic Chapman’s tally of 17, from 1997-98. It can be seen below that there are several rivals for the top scorer title in the league but few can boast a better scoring rate than Waldrom. 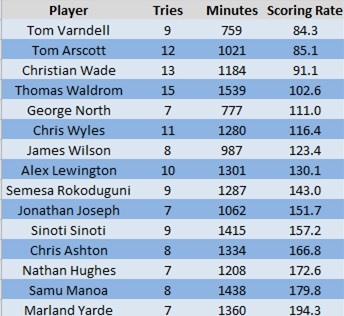 It isn’t a surprise that the joint top scorers from the 2012-13 campaign and proven try machines Christian Wade and Tom Varndell feature here. Wade has scored a total of 41 tries in 62 Premiership appearances at a rate of a try approximately every 114 minutes played. Less expected is Tom Arscott –who had a career record of a try every 436 minutes in the Premiership before this season, but has scored a try every 85 minutes so far in 2014-15. Comparing the Premiership with other leagues, in the Pro12, Craig Gilroy tops the table for tries scored with 11 while Rhys Webb has the best strike rate (of players who have scored five or more) with a try every 90.8 minutes. In his final season for Toulon, David Smith has scored 13 tries in the Top 14 and at a rate (minimum of seven tries) bettered only by Clermont Auvergne‘s Peceli Yato – who has seven tries in just 542 minutes from the backrow. Taking strength of opposition as a factor, it does stand out that Chris Wyles has scored the majority of his 11 tries against teams in the top half of the table – with no scores against London Irish, Newcastle Falcons or London Welsh. Wyles had scored 14 tries in his six previous seasons for Saracens, at a rate of one every 540 minutes so like Waldrom and Arscott makes for a surprise contender. In contrast to Wyles, seven of Waldrom’s tries have come against the bottom two sides and five of Arscott’s were just against London Welsh. Wade’s total was boosted by a hat-trick against London Welsh in November, but he also scored a brace against Saracens at Twickenham and three tries at Northampton. Combined, the current Premiership top try-scorers on that table have scored 37% of their tries against top half of the table sides and it is the same rate in the Top 14. The Pro12 list above has a lower percentage of 21%, with only Tim Visser and Gilroy scoring more than twice against teams currently ranked first to sixth. Ten of the 15 Pro12 players listed have scored a third or more of their tries this season against the Italian sides of Treviso and Zebre. Looking at the split between tries scored at home or away, Northampton’s James Wilson has continued a trend from last season of scoring his tries away from Franklin’s Gardens. Five of his six tries in 2013-14 were scored on the road and seven of eight this year. In the previous two seasons Niko Matawalu scored 11 of his 15 league tries at home, however in 2014-15 just one of his six scores has occurred in Glasgow. Even allowing for the nature of the Top 14, Brive do have a poor away record with 44 losses from their previous 50 trips. Despite that, their winger Benito Masilevu has a creditable five away tries this season including a brace at the usually miserly Racing Metro. At the other end of the scale, a fellow Fijian in Metuisela Talebula has scored all eight of his tries at home. Looking ahead to the 2015-16 season, Clermont are losing Napolioni Nalaga to Toulon. The Sigatoka-born winger scored 79 tries in 131 Top 14 matches and 25 tries in 37 European outings. His replacement is Waisake Naholo, six years younger and also from Sigatoka. The powerful winger scored nine tries in 12 matches for Taranaki in the ITM Cup and has eight in ten games for the Highlanders so far this year. Naholo was also part of the New Zealand Under 20 squad that beat England 33-22 in the 2011 Junior World Championship final. Peers from that tournament such as Wade, Gilroy, Talebula and Alipate Ratini have all gone on to trouble defences in the Northern Hemisphere and it looks a safe bet that Naholo will be joining them on the try-scorer charts next season.